Thanks to some great PR information from Allison Rhodes at OpenDNS, I have learned that PhishTank has launched today, at the beginning of National Cyber Security Awareness Month. 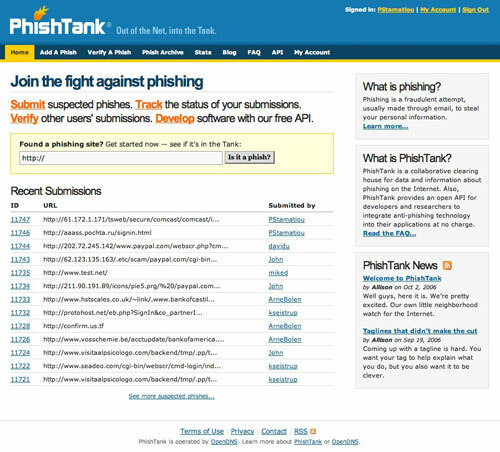 PhishTank as you can probably guess from its spelling has something to do with online phishing, phishers and malware. Created by the innovative people at OpenDNS, it creates an openly accessible database of known phishing sites. The best part, however, is that users have the ability to access the database and various stats via an open (read: free, as in WordPress) API. Actually I lied, the best part is the ability for users to submit any phishing sites they come across; either by email, the web or their API. 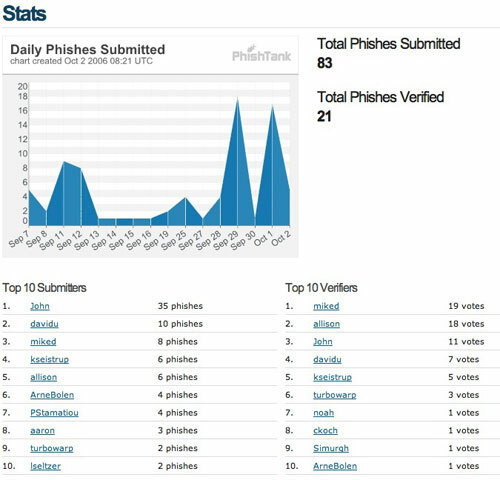 PhishTank creates a community among its users and is probably the first "social media meets phish fighting web service" service. That being said, users can verify phishing sites submitted by other users ensuring that people can't just submit PaulStamatiou.com as phishing site. There are also some backend mechanisms in place so that a group of users can't game the system (like people do with digg) and verify good sites as phishing sites. Adding a phish on PhishTank is a simple process.. I just submitted 4 in the last few minutes. You can either go straight to submitting the phish or you can check to see if PhishTank is already aware of the phishing site you are looking to report, with the "Is it a phish?" form on the homepage. Then, adding a phishing site is as easy as providing the offending URL, email content and the organization the phishing site is pretending to be. I can already see someone developing a WordPress plugin, or perhaps an update to Akismet, that utilizes PhishTank's API to check commenters' URLs to ensure they aren't phishing sites. I must give the OpenDNS guys a thumbs up, PhishTank is an ingenious name requiring almost no explanation. Check it out and become part of the community by creating an account. If you still have questions, PhishTank has a mighty comprehensive FAQ. And if you're still scratching your head as to what OpenDNS is, take a look at my post entitled OpenDNS Makes Your Internet Uber.